Where Did My Customers Go? It’s Your Career, Manage It! Giving feedback is challenging for everyone. No one wants to hear that she isn’t doing a good job. And thus no one wants to tell her. Telling your boss you’re frustrated or aren’t hitting your targets can be even more difficult, and thus many of us don’t. Worse, is that most feedback, positive or negative, is useless because it’s vague. 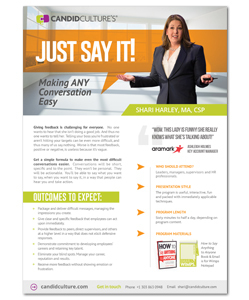 Get a simple formula to make even the most difficult conversation easier. Conversations will be short, specific and on point. They won’t be personal. They will be actionable. You’ll be able to say what you want to say, when you want to say it, in a way that the other person can hear you and take action.